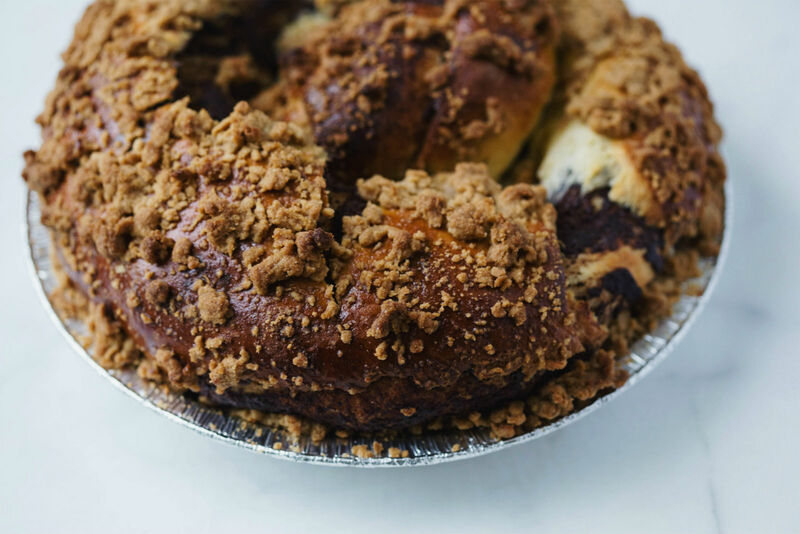 There’s nothing more comforting than a slice of babka and a glass of milk to break a long fast on. In my family, it’s pretty much all we eat. But I don’t always make babka, and I do always make challah, especially during High Holiday season. And so, for convenience, I started setting aside one portion of my challah dough, rolling it out like babka, and filling it with chocolate, creating a babka-challah hybrid. It saves me time, tastes delicious, and since my challah dough is pretty enriched, works just as well as my babka dough. Here, I’ve adapted my challah recipe to yield just one round, perfect spiral filled with chocolate and spice. I’ve found that using both cocoa and melted chocolate in the filling creates the richest, gooiest interiors. I combine chocolate with a bit of olive oil, salt, sugar, and spice in a pot, and while they melt, I spread the dough with oil, cocoa, and sugar. Then I drizzle the chocolate over the cocoa spread dough. 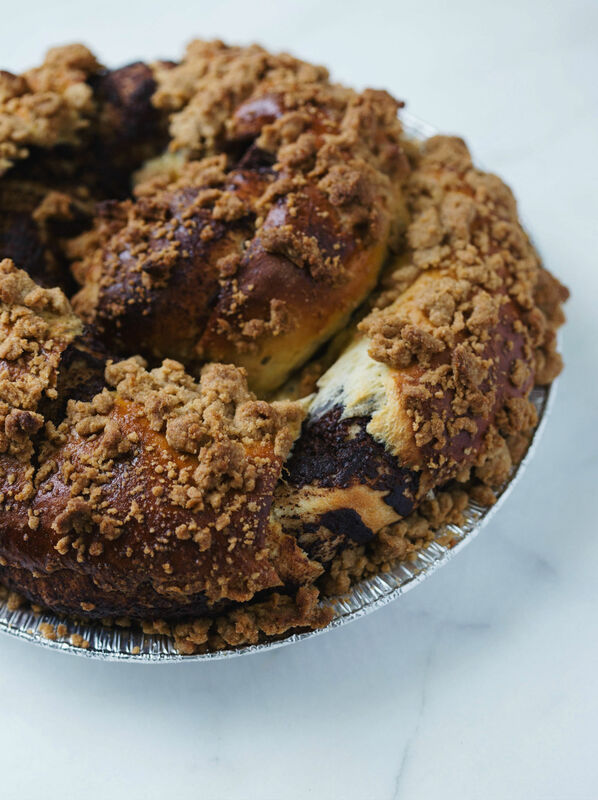 Rolled up in a log, twisted into a spiral, and baked with a crown of buttery, cinnamon flecked crumbs, it’s warm, melty, and decadent, and I can’t think of a better way to enter the New Year. Variations: You can use margarine or Earth Balance in place of oil in the crumble to make it completely non-dairy. Not a fan of margarine? You can also combine ½ cup of sugar, ½ cup of flour, ¼ cup of vegetable, a dash of cinnamon, and a sprinkle of salt for a butter and margarine free topping. You could even add a drizzle on top: combine 1 cup of confectioner’s sugar with ¼ cup of hot water, a splash of vanilla, and a pinch of salt and whisk it well to combine. Drizzle over the challah while it’s hot. While the dough rises, make the filling: melt the chocolate with the oil in a pot over low heat on the stovetop. Add the sugar, salt, and spices and to the pot and stir to combine. Refrigerate to cool until needed. On a floured surface using a rolling pin, roll the dough out to an 18- by 10-inch rectangle, with the long side nearest you. Brush the 3 tablespoons of olive oil over the dough. Sprinkle the cocoa over the greased dough. Top with the sugar and mix with your hands to combine. Starting with long side farthest from you, roll dough into a snug log, pinching firmly along the seam to seal. Coil the log to form a round challah and place in a pan to rise, around 40 minutes. Add the butter and use your fingertips to mix everything together until crumbs form. Set aside until needed. Put oven rack in middle position and preheat oven to 375°F. 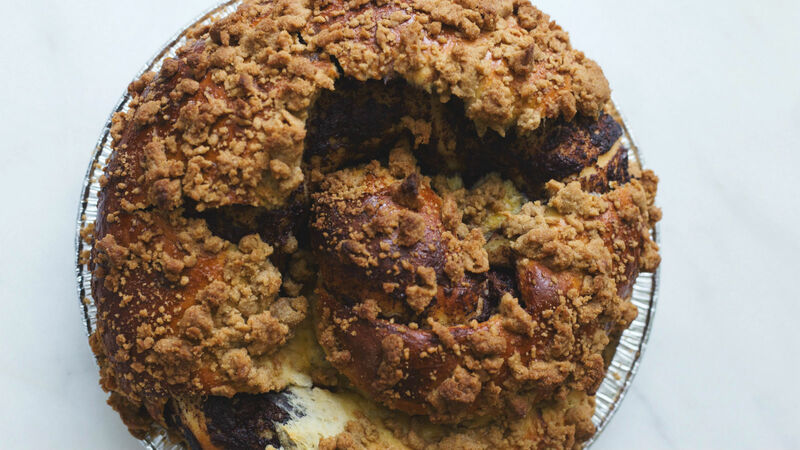 Brush the top of the challah with egg wash. Sprinkle with crumble. Bake until the top is a deep golden brown, about 40-50 minutes. Transfer challah to a rack and cool to room temperature. Serve.